Lama Zopa Rinpoche doing an incense puja at Kachoe Dechen Ling, Aptos, California, US, May 2014. Photo by Ven. Thubten Kunsang. “Depression can be a good thing, because it is a sign of purification, of having practiced Dharma. “There are different levels of how negative karma is purified. With the first level, you never experience the suffering results of your actions. With the second level, you experience these results, but rather than experiencing the suffering result of the negative action for many eons in the lower realms – the hell, hungry ghost or animal realms – instead, the result manifests in this life in the form of some problem, such as depression, a toothache or headache, or being criticized by people and so forth. Unbelievably negative karma manifests as just this problem or even as bad dreams or nightmares; often in the form of sickness, failure in business, or some disaster in your family or in your relationships – other people treating you badly or abusing you; and also in the form of depression. 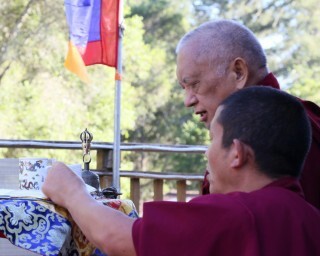 Lama Zopa Rinpoche doing incense puja at Kachoe Dechen Ling, Aptos, California, US, May 2014. Photo by Ven. Thubten Kunsang. “This way you never have to experience the heavy suffering for an incredible length of time, therefore, experiencing this depression is a positive thing. This can be related to whatever problems you have, so you feel positive and happy about them. You should understand all the rest of your problems, whatever you have, in this same way. “Then there’s the next level of purifying karma. By experiencing this [suffering result] now, you don’t have to be reborn in the lower realms, or maybe for a very short time and the suffering is very light. For example, when you throw a stone on a rock, it hits in one second, like snapping your fingers. Similarly, in that way, all those heavy sufferings for a great length of time are finished instead, by experiencing this suffering now. If you compare that to the experience of heavy suffering for an incredible length of time, it’s very positive, very good. It’s fantastic! 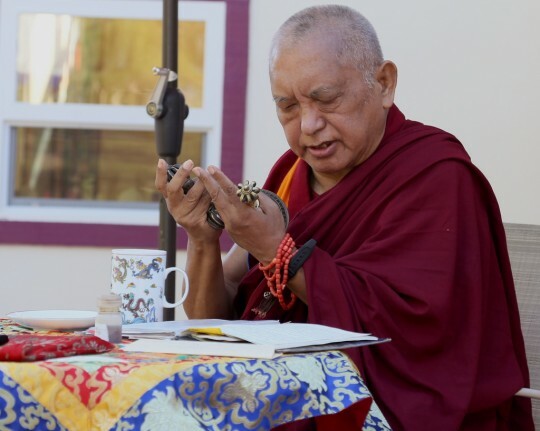 You can read the complete post “Advice on Transforming Depression,” part of “Lama Zopa Rinpoche’s Online Advice Book,” on the Lama Yeshe Wisdom Archive. 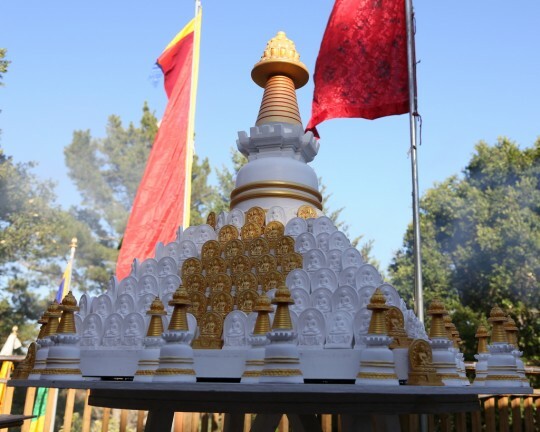 A stupa surrounded by tsa-tsas at Kachoe Dechen Ling, Aptos, California, May 2014. Photo by Ven. Thubten Kunsang.